Whether you are new to road riding or a cycling veteran one of the most exciting elements to the 2019 Ballarat Cycle Classic is that all road courses involve riding the WORLD RENOWNED Australian National Road Cycling Course. Proudly sponsored by Protect, the three courses involve quiet undulating country roads with the 50km Classic event designed as the ideal ride for casual or beginner riders. Bring a mate and ride together. After a short climb out of Ballarat the ride meanders along generally flat terrain through scenery that showcases the beauty that is the Ballarat region. Rolling plains of sheep and cattle grazing pasture, irrigated fields of potatoes and sensational views of ancient volcanoes make this an unforgettable experience. Take in the views from beside Mt Buninyong east towards Melbourne, and then ride through the fertile volcanic rolling plains back to Ballarat. 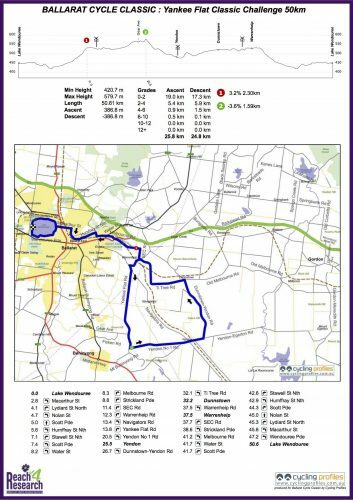 All ride options come together in Dunnstown before re-entering Ballarat for the return route up Macarthur Street followed by a clockwise ride around Lake Wendouree back to the Cycle Classic village in Windmill Drive. If you have always wanted to give road riding a go and have good fitness, this is the ride for you. Dust off your bike and start training today! Take on parts of the WORLD RENOWNED Road National Course. Ride along safe, quiet picturesque country roads. All courses are fully supported with safety marshals, water and food stations, as well a roving mechanic. Registration Jersey and event bibs need to be picked up prior to the ride. This can be done on Saturday 16th onsite between 2-6pm, alternatively from 7.00am on the day. In case of incident/emergency, please save the above contact number into your mobile for future reference. For all serious issues requiring Police, Fire or Ambulance, please contact ‘000’ immediately and then inform control room. The event village We have created an event village that is fun for the whole family. There will be a selection of food and beverage, face painting, kids activities, live music and a bar area for a celebrationary post ride drink, on us! (we’ll have a sausage waiting for you too). Riders must obey road rules and traffic signals at all times; where riders fail to obey road rules, Police will take appropriate action. • No racing and no pelotons – The Ballarat Cycle Classic is not a race. No pelotons larger than 20 are permitted on open roads. The Ballarat Cycle Classic will be marked with directional signage throughout the course. Riders deviating from the course will not be covered by our event insurance. Be sure to familiarise yourself with the course prior to the event. We have included it below, however we will also have hard copies available at the registration tent. Aid stations will be provided around the course. We will keep you well hydrated and energised with water, lollies, cake and bananas. Should you prefer sports drinks or gels, feel free to provide those for yourself. For rest stop locations, please refer to course map. First Aid support will be provided by St Johns Ambulance Service. First Aid teams will be on course at all times. There will also be a First Aid tent in the event village. On course mechanical support is available at all times, so whether you puncture, break a chain or need your gears tweaked, you will be in safe hands. A lead vehicle, featuring warning signs will travel ahead of riders for the 100km & 85km course. The lead vehicle will warn motorists of oncoming cyclists. Riders should not attempt to pass the lead vehicle. A sag wagon will follow the last rider on the course. For those riders unable to finish the course, you will be able to place your bike in a trailer and the sag wagon will drop you back to the event village at the completion of the ride. Riders who stop for long periods of time risk being overtaken by the sag wagon and in turn no longer serviced by event support crews. Road Ride cut off time. The course will be supported from 8am-1pm. For the safety of cyclists and volunteers, the cut-off time will be imposed at Dunnstown at 1.00pm. For those who arrive after 1.00pm, you are more than welcome to continue the ride, however it will no longer by serviced by event marshals.